In all that sun, and being such a long day, it’s something of a blur, but my photo of Vince Ting of Wimbledon Windmilers seems pretty pin sharp. Even taking many, many thousands of pictures on the day I think Vince was the only runner I recognised (and gave encouragement too after this shot)! 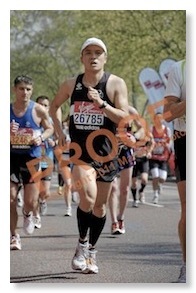 The photo is among many that can be order form the Marathonfoto website.